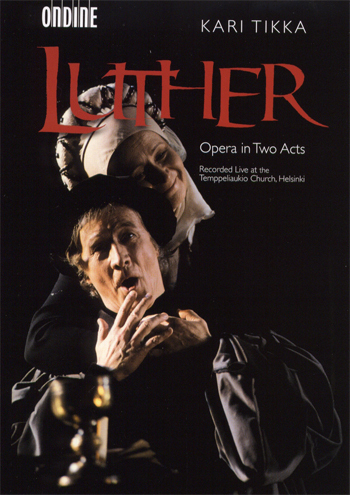 This DVD Video features the two-act opera Luther by Finnish composer and conductor Kari Tikka, who also wrote the libretto with the collaboration of Jussi Tapola. It tells the life story of the German theologian and church reformer Martin Luther (1483-1546). This live recording was made in May 2003 at the Temppeliaukion Kirkko ("Rock Church") in Helsinki, where the work's world première had earlier taken place in December 2000. The Finnish National Opera production is staged by Jussi Tapola, with conductor Kari Tikka leading a cast of soloists from the Opera. Andrus Mitt: Frederick the Wise, Prince Elector of Saxony. The DVD bonus features include an introduction to the work by the composer and the performers, as well as a presentation of the world-famous Rock Church. A co-production of the Finnish National Opera and Ondine, this is the first release for commercial international distribution of any Finnish classical opera on DVD. This all-regions NTSC disc is designed for worldwide playback. In PAL regions (e.g. Europe, Australasia & Africa) ensure your DVD player and TV are PAL/NTSC compatible ("dual-standard").